Arcade Puzzler in which you herd sheep! If you've ever fancied yourself a sheep herding thief than this will be the game for you. In it, you play the role of a cunning sheep thief, tasked with stealing sheep from a number of enclosures. As you would imagine half of the problem is making sure that the sheep themselves stay together as a group. The other half of it, is you trying to show the sheep which is the way to go. This is done by herding them from behind! That's right, you have to place yourself in the back of the herd, and try to understand where they would go if left o their own, while trying to impose your own will upon their trajectories. He, at least if it was this easy! As the levels progress new challenges will become apparent. Not only will you have to establish the trajectory of the sheep, but you will also have to make sure they don't go places where they might be spotted by the guardians, while in other scenarios using decoys and such will be needed. 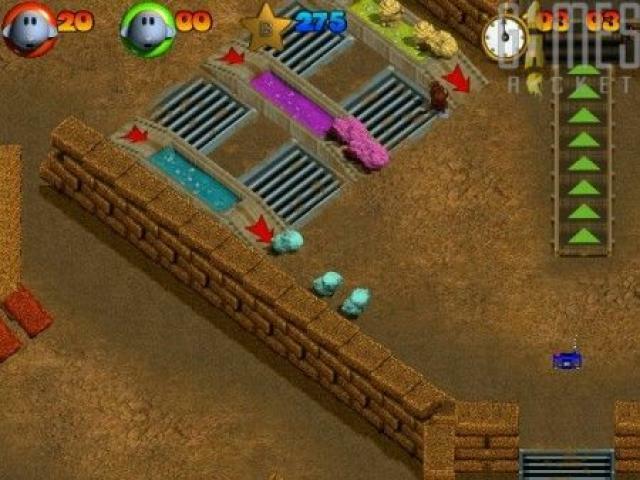 The game has a feel that is similar to Lemmings, however, the end result and the overall control scheme is different. Graphics wise the game is an isometric one, but the models and the design feels original on its own terms.